This article picks up where I left off a week ago which you can read here. 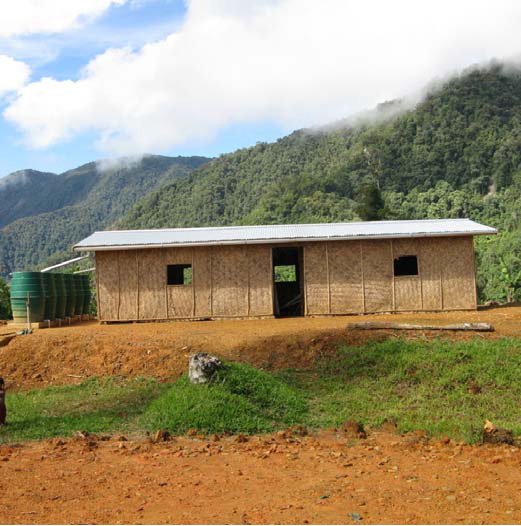 I felt rather discouraged when I left PNG in October, 2010. 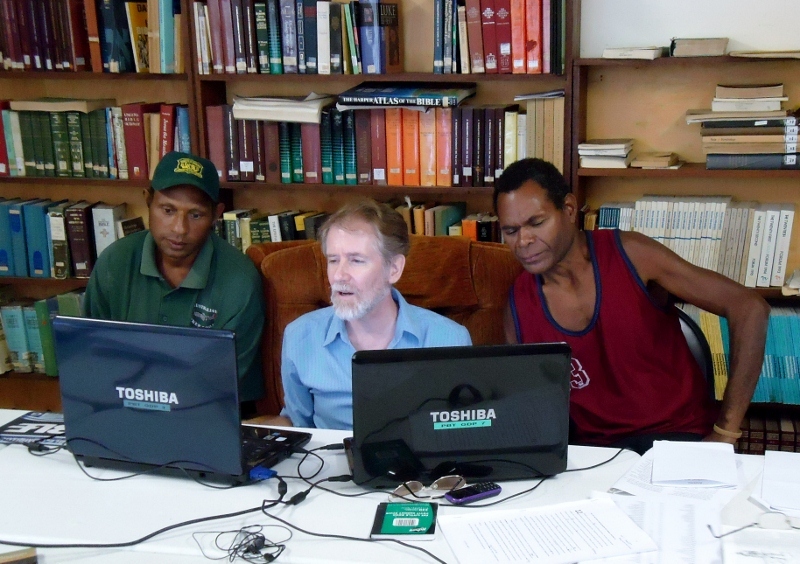 I had thought that our plan for a five-week trip to Papua New Guinea would be sufficient time for us to be able to check the Gospel of Matthew in the W. language. But with me needing at least 4 days to travel there and 4 more days to come back, plus an adjustment period of a few days, we really only had about three weeks to do the work. And normally, that would have been plenty of time. But as I wrote last week, there were the issues of illnesses and deaths that cast quite a shadow over our work and caused us to end our checking sessions earlier than planned. So we only finished checking 20 chapters of Matthew. And in light of this, Jill and I started asking ourselves different questions. One of the first questions we asked was, “Should I (Norm) try to plan a longer trip so that I can accomplish more, or at least do the same amount of work that I would normally get done after two short trips to PNG?” It certainly would be financially smarter to do one long trip, rather than two short ones, because of how much airline tickets cost just to get there. And so we weighed out these questions, while at the same time we considered the requests from the Branch for me to come back in early 2011 to help do the consultant checking on a number of New Testament books. I was asked to help finish the book of Matthew in the W. language, then check up to as many as five Pauline epistles for a second language, and then the book of Hebrews in a third language. My decision was to say “Yes” to all these requests, for I knew how difficult it was to get consultants to do the checking sessions. But considering that there were only about 13 weeks for me to get my prep work done, and there were 39 chapters to check (mostly epistle material), the chances were slim that I could do all the preparation before I headed over there. I knew I would have to make some choices based on the priority and checking dates of each project. So here is what I decided. Even though it would be the last material checked, I prepared my comments and questions for the first 10 chapters of Hebrews. It is a very fascinating book, and I really had no idea how difficult and complex it would be. It took me over a month to prepare these 10 chapters. I figured that the last three chapters could be worked on once I got to PNG. Then I switched to doing checking preparation on the other epistles (Eph., Phil., Col., Philemon, and Jude) for the T. language group. Now by just looking at my weekly average of doing prep work, I was certain I could do the first three epistles before flying down under. Philemon and Jude would have to wait until I got into the country to finish them. And as for Matthew, I knew the translation team quite well by this time, and so I told them that I could work with them without having the written VE (Vernacular-to-Englush) texts. I would depend on listening well to an oral back-translation of the text. And so the checking sessions started on February 3rd with the T. language team. It was amazing to see how quickly we were able to do the checking of the three larger epistles (Ephesians, Philippians, and Colossians). It took roughly two days to check each book. Mind you, the average length of all the chapters of these books is about 25 verses. So that means we were checking on average about 8 verses per hour. The team wanted to get back a bit early, so we didn’t try to check Jude or Philemon. They will have to wait till later. 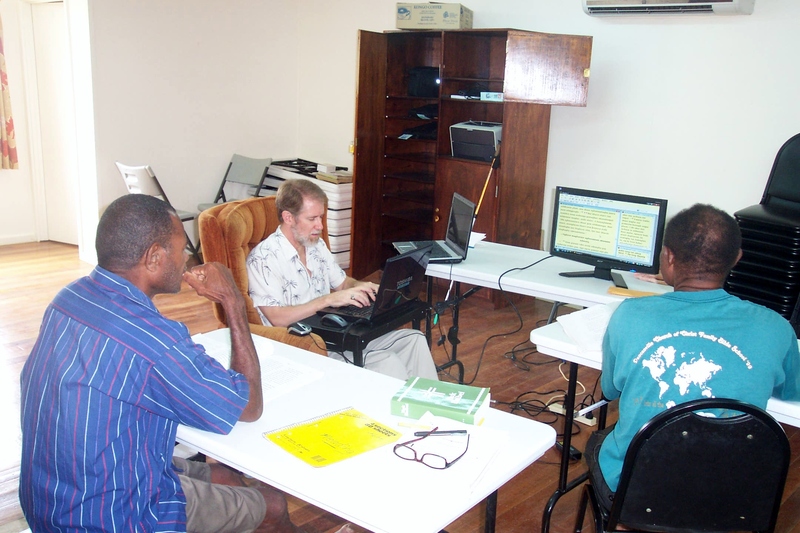 That gave me a two-day rest before working with the W. language team on the last 8 chapters of Matthew. And again, we did the work in just over 6 days of work. Did you know that Matthew chapter 26 (75 verses) and chapter 27 (66 verses) are the 2nd and the 5th longest chapters in the New Testament? After spending a month in the highlands of PNG, then Jill and I flew down to the main city of Madang on the north shore where our mission office is located. We enjoyed a few days of rest and a bit of relaxing beside a swimming pool, and then I dove into the checking sessions of Hebrews with the A. language team. It was delayed slightly, which didn’t surprise me, as it is always so difficult for the nationals to walk, float, drive or even fly out of their villages to get to town. Since this was the first time I worked with this language group, I allowed up to 12 days to get the entire book checked. And again, God gave us all the strength, wisdom and insight to check and revise the material in just 8 days. This allowed me to get some other language catch up work done, and to get rested before I started my long journey back to Canada. Last week I was working with the W. language team and checking their translation of the final eight chapters of the book of Matthew. The translation was in very good shape, so we were able to proceed at a pretty good pace. The goal we had set to be able to check these chapters in eight days was to check an average of 55 verses each day. 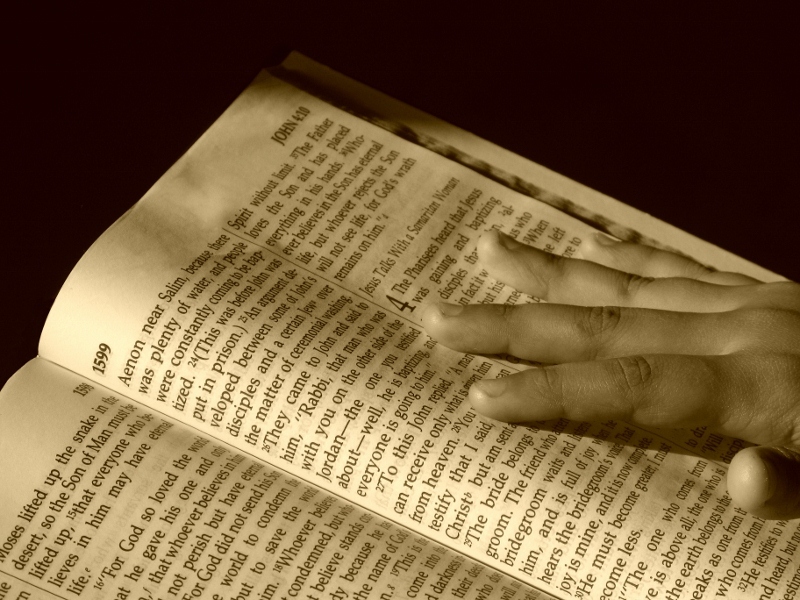 On the morning that we were finishing chapter 22 and starting chapter 23, we had checked and revised 44 verses. So when we gathered after lunch to continue doing the checking, I was feeling optimistic that we would be able to easily reach our goal, and surpass it. But then we hit the “Woe” sections of chapter 23 of Matthew. Seven times Jesus gave a strong warning to the Pharisees and the Scribes, two of the religious groups that existed during the times of Jesus and the New Testament. And both groups knew all the rituals and regulations of the Jewish religion, but they only gave lip service to God rather than serve Him out of their hearts. There is no question that these “Woe” sections of Matthew 23 are difficult to translate across different languages. There are many concepts that are rather foreign to people who are subsistent jungle farmers. How do we translate “Kingdom”, “temple”, “altar”, “tithing”, “proselytizing”, etc. We did find ways to handle these difficult concepts, but there is one more term in this section that has caused us to discuss it at length. The term I am referring to is the word for “hypocrite”. 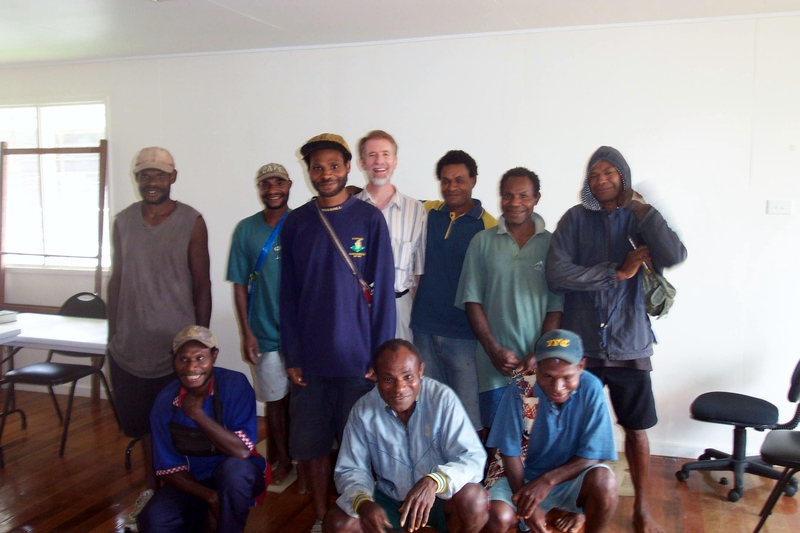 I have had the privilege to work with a number of Papuan languages and have checked the books of Matthew and Mark a couple of times. And I am fascinated by the variety of ways in which different languages can handle the same term or phrase. And this is definitely one of them. The common thread here is that a hypocrite is one who basically lies, pretending to be one thing when in fact they are the opposite. They are people who deceive others by saying one thing, but their behavior shows that their values do not match their behavior. As the idiom in English says, they in effect speak out of two sides of their mouth, which is very close to the Papuan idiom of being two-tongued or two-mouthed. In effect, these are nasty, lying, deceiving people who not only are trying to fool men into believing they are good people, but some are even thinking they are pulling the wool over God’s eyes. And of all possible kinds of hypocrites, perhaps the worst ones of all are the religious hypocrites. By their words and actions, they try to elevate themselves as someone better than other religious people, and in the end, they tarnish the name and reputation of God, and the true believers who worship God as He requires, out of a heart of humility and selflessness. And yet, when I really study this word and all that it implies, I need to be careful before I brand someone else with this word–hypocrite. True, it is very obvious in Scripture that the Pharisees and the Scribes were very bad men, but am I that much different. In degree, yes. They were fierce and terrible opponents to Christ, and they ultimately had Jesus crucified out of pure jealousy against Him. But in nature, I am a sinner just as much as they were. And am I not guilty in many instances of some level of being a hypocrite. I tell people I will pray for them, and do I follow-up on my promise to do so? Not always. Do I dress in my nicest clothes and put a smile on my face when I go to church, sending the message that I am well-to-do and that my life before God is all in order, when in fact I may be falling apart inside, and having doubts about God’s goodness? We are encouraged in Scripture to make the most of every opportunity (referring to share Christ), but often I have no desire to talk to the person next to me on the airplane. Do I turn away and pretend not to notice the poor man coming my way who is asking people for a quarter? Can I truly call myself a “follower of Jesus”, when I act in so many ways that would be contrary to how Jesus would act? Dear Readers, I know that I, and perhaps you too, still have a lot to learn in the School of Discipleship. Jesus has set a good example, and He is our Headmaster. Let the school of humility, selflessness, love for others, and self-sacrifice begin.